Hot on the heels of announcing his 100% Fresher stand-up tour, Adam Sandler is returning to his old stomping grounds, Saturday Night Live, for his first-ever hosting gig, Deadline reports. Expect Opera Man’s signature wig and cape to get dusted off on May 4, when Sandler will very likely trill alongside Colin Jost and Michael Che. Shawn Mendes will be the musical guest. Sandler joined the show as a writer in 1990, going on to serve as a featured performer from ‘91 to ‘95. 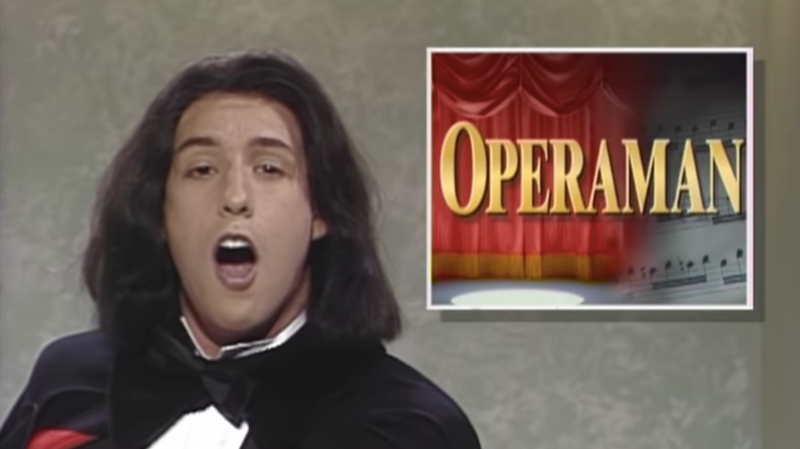 He’s remembered fondly by longtime fans of the show, having cemented his legacy with not just Opera Man, but also Cajun Man, Canteen Boy, and “The Denise Show.” Expect any of them to return—Alec Baldwin would probably be willing to reprise his Canteen Boy role, but one wonders how that sketch would play for today’s audiences—but, sadly, the passing of Chris Farley means it’s probably best to leave Sandler’s two best characters, cranky old-timer Hank Gelfand and The Herlihy Boy, in the past. What does Adam Sandler’s stand-up look like in 2018?